This article is about the film. For the novel on which it is based, see Catching Fire. The Hunger Games: Catching Fire is a 2013 American dystopian science fiction adventure film based on Suzanne Collins' dystopian novel Catching Fire (2009), the second installment in The Hunger Games trilogy. The film is the sequel to The Hunger Games (2012) and the second installment in The Hunger Games film series, produced by Nina Jacobson and Jon Kilik, with co-production by Lionsgate Films and distributed by Lionsgate Entertainment. Francis Lawrence directed the film, with a screenplay by Simon Beaufoy and Michael Arndt (under a pseudonym). Adding to the existing cast, the supporting cast was filled out with Philip Seymour Hoffman, Jeffrey Wright, Sam Claflin, Lynn Cohen, Jena Malone, and Amanda Plummer. Filming began on September 10, 2012, in Atlanta, Georgia, before moving to Hawaii. The plot of Catching Fire takes place a few months after the previous installment; Katniss Everdeen and fellow District 12 tribute Peeta Mellark have returned home safely after winning the 74th Annual Hunger Games. Throughout the story, Katniss senses that a rebellion against the oppressive Capitol is simmering throughout the districts. The Hunger Games: Catching Fire was released on November 15, 2013, in Brazil; November 20 in Finland, Sweden, and Norway; November 21 in the United Kingdom; and November 22 in IMAX, in the United States. The film set records for the biggest November opening weekend and biggest three- and five-day Thanksgiving box-office totals, surpassing the first film's box office grosses. It ranks as the 14th-highest-grossing film at the domestic box office and the highest-grossing film at the domestic box office of 2013, becoming the first 2-D film since The Dark Knight (2008) to top the yearly box office, as well as having a lead female top the box office since The Exorcist (1973). The film has grossed over $865 million worldwide and is the fifth-highest-grossing film of 2013 and the highest-grossing entry in The Hunger Games series. The film was followed by The Hunger Games: Mockingjay, a two-part sequel and finale of the franchise: Part 1 was released on November 21, 2014, in the United States, and Part 2 on November 20, 2015. Catching Fire received positive reviews and is widely considered by critics to be an improvement over its predecessor, with the sentiment being that it's "a more-confident, more-polished movie"; praise also goes to Lawrence's performance as Katniss. It's the most critically acclaimed chapter in The Hunger Games series, according to review aggregator Rotten Tomatoes. The film also received numerous nominations, with a nomination for the Broadcast Film Critics Association Award for Best Action Film and a Saturn Award for Best Science Fiction Film. For her performance, Lawrence was nominated a second time for the Empire Award for Best Actress as well as the Saturn Award and Broadcast Film Critics Association Award. The song "Atlas" was also nominated for the Grammy Award for Best Song Written for Visual Media and a Golden Globe Award for Best Original Song. After the 74th Hunger Games, Katniss Everdeen and Peeta Mellark return to District 12, where President Snow visits Katniss. Snow explains that her actions in the Games have inspired uprisings. He orders her to use the upcoming Victory Tour to convince people that her actions were out of love for Peeta and not defiance against the Capitol, or District 12 will be destroyed, "just like District 13". He makes Katniss promise that the two will not lie to each other. As the tour begins, Haymitch Abernathy warns Katniss and Peeta that the show of their relationship must continue for the rest of their lives. Katniss suggests they announce their engagement, which is approved by Snow, with their wedding to be staged at his mansion in the Capitol. Katniss warns Gale, her neighbour and friend, of Snow's threat. Peacekeepers crack down on District 12, and Gale is publicly whipped after attacking the Head Peacekeeper, Romulus Thread. Snow announces that the third Quarter Quell of the upcoming Hunger Games will involve tributes selected from previous victors, guaranteeing that Katniss will be selected as she is the only living female victor from District 12. Katniss immediately devotes herself to ensuring Peeta's survival, and makes Haymitch promise to help. At the reaping, Effie Trinket draws Katniss's and Haymitch's names, but Peeta immediately volunteers to take Haymitch's place. Haymitch reveals that the tributes are angry about being returned to the Games, and all of them will most likely attempt to stop the games. For her pre-Games interview, Katniss wears a wedding dress, as ordered by Snow, but her stylist Cinna sets it to transform into a representation of a mockingjay. Peeta announces on-air that he and Katniss secretly married and are expecting a child. The audience of Capitol citizens protests and shouts for the Games to be stopped, to no avail. Just before Katniss enters the arena, Cinna is severely beaten by Peacekeepers in front of her, then dragged away. In the Games, Katniss allies with Finnick Odair and the elderly Mags, his mentor. When the arena's force field shocks Peeta, stopping his heart, Finnick revives him. The group flees from a poisonous fog, with Finnick carrying Mags, but when Peeta cannot go on, Mags sacrifices herself so that Finnick can help him. When mandrills attack, Peeta is saved by the unexpected sacrifice of a hiding tribute, the female from District 6. The group escapes to the beach around the central lake, where Finnick greets District 3's Wiress and Beetee and District 7's Johanna Mason. Wiress repeats the phrase "tick-tock", leading Katniss to realize that the arena is designed like a clock, with unchanging hazards each hour contained within their respective zones on the clock. As the team waits for the next danger, Wiress is stabbed to death by Gloss, who alongside his sister Cashmere, and District 2 tributes Brutus and Enobaria, comprise the Careers. Gloss is immediately fatally shot by Katniss while Johanna kills Cashmere with her axe. Finnick is injured by Enobaria's knife, and after the Gamemakers spin the clock to disorient the tributes, they quickly leave the beach for the woods. Beetee suggests luring the Careers to the wet beach and electrocuting them by running his wire to the lake from a tree that is struck by lightning every 12 hours, having won his games by doing so, killing six tributes at once. The group separates to prepare the trap, Finnick and Peeta protecting Beetee, and Katniss running the wire down to the beach with Johanna. While pulling the coil, an unknown source of tension makes it apparent another tribute is on their tail. When Brutus and Enobaria emerge, Johanna knocks Katniss to the ground, cuts the tracker out of her arm, and flees. Katniss returns to the tree and finds an unconscious Beetee. Unable to recover Peeta, and hearing a cannon (which was Peeta killing Brutus), Katniss almost kills Finnick, thinking he broke the alliance and attacked Peeta, but he reminds her to remember who "the real enemy" is, as Haymitch had advised her before the games. Katniss attaches the wire to an arrow and shoots it into the arena's roof just as the lightning hits. The lightning strike paralyzes Katniss and incapacitates Finnick, causing a power failure that brings down the dome and disables the security cameras inside the arena, preventing the Capitol from observing the events. Katniss awakens in a hovercraft with Beetee, who is still unconscious. She finds Haymitch, Finnick, and Plutarch Heavensbee, the new head Gamemaker, who is revealed to be a rebel against Snow. He tells her they are bound for District 13, headquarters of the rebellion, and that half the tributes (the ones from 3, 4, 6, 7, 8 and 11) were recruited to help Katniss escape, as she is the symbol of the growing rebellion. They were unable to rescue Peeta and Johanna, and they are captives in the Capitol. Katniss is sedated after attacking Haymitch for not keeping his promise to protect Peeta. She later awakens to find Gale by her side. He assures her that her family is safe, but that District 12 has been destroyed after Snow was made aware of the rebels' plot. Lionsgate announced that a film adaptation of Catching Fire would be released as The Hunger Games: Catching Fire on November 22, 2013, as a sequel to the film adaptation of The Hunger Games, with principal photography to take place in September 2012. Simon Beaufoy was hired to write the script for the film and wrote two drafts before leaving after Gary Ross, director of The Hunger Games decided not to direct the sequel. The shooting timeframe was co-ordinated between Lionsgate and 20th Century Fox, in order to allow time for Jennifer Lawrence to shoot X-Men: Days of Future Past, the sequel to Fox's X-Men: First Class, in January 2013. On April 10, 2012, it was announced that Gary Ross, director of The Hunger Games, would not return due to a 'tight' and 'fitted' schedule. Bennett Miller, Joe Cornish, Francis Lawrence and Juan Antonio Bayona were all being considered to direct the new film. On April 19, 2012, it was announced that Francis Lawrence was offered the director position for the film. Lionsgate officially announced Francis Lawrence as the director for Catching Fire on May 3, 2012. Two days later, it was reported that Michael Arndt (Toy Story 3, Little Miss Sunshine) was in talks to re-write the script for Catching Fire. On May 24, 2012, the film was renamed The Hunger Games: Catching Fire and Arndt was confirmed as the new writer of the script. Arndt was paid $400,000 a week for re-writing the script. According to sources, the adaptation needed to be done filming by December 2012 to fit Jennifer Lawrence's schedule. When X-Men: Days of Future Past lost its original director and shooting for the film was delayed till April 2013, Jennifer Lawrence was no longer needed to be filming in January 2013 and the shooting timeframe for The Hunger Games: Catching Fire was extended to March (including several breaks due to the holidays and awards season). The film featured sequences filmed in the IMAX format. In July 2012, it was announced that Jena Malone would portray Johanna Mason, that Amanda Plummer would portray Wiress, and that Philip Seymour Hoffman would portray Plutarch Heavensbee. Following this, in August 2012, it was announced that Lynn Cohen had been cast as Mags. Alan Ritchson was cast as Gloss on August 9, Sam Claflin as Finnick Odair on August 22, and Jeffrey Wright as Beetee on September 7. Lawrence, Hutcherson and Hemsworth all dyed their hair for the movie once again. Lawrence went back into archery training in order to get in shape for the role while the supporting cast undertook training in preparation for the arena scenes. Production officially began on September 10, 2012, with shooting concluding for some of the cast on December 21, 2012. After the Christmas break, filming resumed for two weeks in mid January for some of the main cast and was placed on hold for awards season. Principal photography resumed and concluded in March 2013. Shooting first took place in and around metropolitan Atlanta, Georgia and then moved to Hawaii, to shoot the arena scenes. The cast and crew were on a busy schedule, working 14-hour days and six days a week. In an interview with MTV, Josh Hutcherson confirmed scenes in the film would use IMAX cameras by stating, "They're shooting, I think, all the stuff in the arena is going to be IMAX". Jennifer Lawrence and Liam Hemsworth were in Ringwood, New Jersey shooting District 12 scenes involving snow for the beginning of the film on January 31 and February 1. Jennifer Lawrence confirmed that she would fly out to Hawaii on February 25, the day after she won the Academy Award for Best Actress at the 85th Academy Awards to shoot for the final 9 days along with Claflin and Hutcherson. In late March, filming occurred in the Universal Studios backlot and was kept extremely secretive. Witnesses reported of towers and fences on set. None of the main cast were believed to have been on set. Reshoots were scheduled for April 13 in Atlanta. With the base camp set up at Executive Park off North Druid Hills Road, filming also occurred at the Goat Farm Arts Center. Francis Lawrence has estimated an hour of the film would be devoted to Arena scenes, and said that cameras would be mounted to avoid the shaky-cam look from the first film. In an IMAX featurette, Francis Lawrence also confirmed that scenes taking place in the Arena were shot on IMAX cameras to distinguish them from scenes external to the Arena. Approximately 50 minutes of the film's footage was shot in the IMAX format, through the use of three IMAX 15 perf/65mm film cameras. Sarah Burton, creative director at Alexander McQueen, gave pieces of McQueen's collection to costume designer Trish Summerville. Summerville collaborated with Indonesian designer Tex Saverio when designing Katniss' wedding dress for the Quarter Quell interviews. British singer Ed Sheeran recorded three songs for the soundtrack, but Lionsgate declined the offer. On May 14, 2013, Alexandra Patsavas was listed in the credits as music supervisor, replacing T Bone Burnett from the first film. Coldplay were announced as the first official artist to be featured on the Catching Fire soundtrack album, with the song "Atlas", released worldwide on September 6, 2013. Christina Aguilera announced that her song, "We Remain", would be part of the official soundtrack of the film. Other artists featured on the soundtrack include Of Monsters and Men with "Silhouettes", Sia featuring The Weeknd & Diplo with "Elastic Heart", The National with "Lean", The Weeknd with "Devil May Cry", Imagine Dragons with "Who We Are", Lorde with "Everybody Wants to Rule the World", The Lumineers with "Gale Song", Ellie Goulding with "Mirror", Patti Smith with "Capitol Letter", Santigold with "Shooting Arrows at the Sky", Mikky Ekko with "Place for Us", Phantogram with "Lights", and Antony and the Johnsons with "Angel on Fire". On November 16, 2012, the first teaser trailer was released with The Twilight Saga: Breaking Dawn – Part 2 and revealed the official logo and tagline for the film. Lionsgate announced a sweepstakes competition where 12 fans would have their name listed in the film's credits. On January 11, 2013, Entertainment Weekly released a 2013 Preview edition of their magazine, with the first look of Lawrence as Katniss and Claflin as Finnick on the cover as well as several stills showcasing scenes from the film. On February 22, both Hitfix and the official Facebook page debuted two viral posters of the Victory Tour featuring Jennifer Lawrence (Katniss) and Josh Hutcherson (Peeta). On January 28, 2013, CapitolCouture.PN, a promotional site for the film's fashion and culture, opened and could only be unlocked with a passcode. Once in, a picture of a blue chair appeared and told readers to check back on March 4. On March 4, 2013, the site began to release portraits of the various characters. Alongside the announcement of the teaser trailer premiering at the 2013 MTV Movie Awards, Lionsgate revealed a new website called TheHungerGamesExplorer. On April 10, the website was updated and fans had to tweet using the hashtag #HungerGamesExplorer to unlock new stills from the movie. A still could be unlocked every day leading up to April 14, 2013, the teaser trailer's release date. The teaser trailer thus debuted at the 2013 MTV Movie Awards on April 14, presented by Liam Hemsworth, and the trailer was posted on TheHungerGamesExplorer and YouTube after the ceremony. "Beyond Fire" by T.T.L. was played as the trailer music. An exclusive new trailer debuted at the San Diego Comic-Con International on July 20, 2013, also being released online on that day. Walmart released the first TV spot on their Facebook page on October 14, featuring Coldplay's song, "Atlas". On October 27, 2013, during the fifth inning of game 4 of the 2013 World Series, the final trailer was released. Three days later, on October 30, 2013, a new IMAX poster for the film debuted. The film premiered at the Odeon Leicester Square theater in London on November 11, 2013. The film was later released on November 22, 2013, in the United States in conventional and IMAX theaters. The film was also shown in the 4DX format in selected international territories. It features motion-enhanced seating, wind, water sprays, strobe lightning, and scent-based special effects. The film was released in 4,165 theaters in the US alone. The Blu-ray/DVD release date for the film in the US was March 7, 2014. The entire Hunger Games series was released on 4K UHD Blu-ray on November 8, 2016. Actresses Lynn Cohen and Stephanie Leigh Schlund, who played Mags and Cashmere in the film, respectively, promoted the DVD and Blu-ray versions of the film with an appearance at the March 7, 2014 midnight release of the product at the Walmart in Secaucus, New Jersey. As of March 16, 2014, Catching Fire has sold 2,073,719 DVDs along with 2,186,430 Blu-ray discs for $35,565,263 and $43,832,928, respectively, totaling $79,398,191 of revenue within two weeks of release. 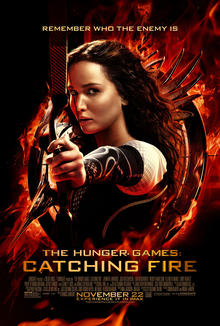 The Hunger Games: Catching Fire received very positive reviews from critics. Review aggregator Rotten Tomatoes gives the film a score of 89% based on reviews from 275 professional critics, with a rating average of 7.55/10. The website's critical consensus reads: "Smart, smoothly directed, and enriched with a deeper exploration of the franchise's thought-provoking themes, Catching Fire proves a thoroughly compelling second installment in the Hunger Games series." It was the highest rated science fiction/fantasy movie of the year on the website. At Metacritic, which assigns a weighted average score out of 100 reviews from mainstream critics, the film received an average score of 76 (indicating "generally favorable reviews") based on 49 reviews. According to polls conducted during the opening weekend by CinemaScore, the average grade audiences gave the film was an A, on an A+ to F scale. The Hollywood Reporter said that the film has received "generally positive reviews" and CNN reported that reviews were "overwhelmingly positive" but noted that "an overarching complaint" was that it "runs needlessly long ... and the screenplay and direction do occasionally fall short." Entertainment Weekly said the consensus was that the sequel is "a more-confident, more-polished movie that delves deeper into Panem's political conflict". It also reported, "Critics are impressed that [Lawrence] commits to Katniss just as much as she would a complex David O. Russell character." Writing for The Village Voice, Stephanie Zacharek praised Jennifer Lawrence's performance, writing that the actress is "both on fire and in the process of becoming, and it’s magnificent to watch." Peter Travers of Rolling Stone gave the film 3.5 stars out of four and said, "Pop-culture escapism can be thrilling when dished out by experts. Katniss is a character worth a handful of sequels. And Lawrence lights up the screen. You'll follow her anywhere." He also commended supporting actors Sam Claflin and Jena Malone. Reviewing on Roger Ebert's website, Susan Wloszczyna of USA Today awarded the film three out of four stars, praising the acting of Jeffrey Wright, Amanda Plummer and Jena Malone and referring to the challenges of the arena as "visually intriguing." Wloszczyna writes: "...the one truly fresh invention—and the one that matters most—is Katniss herself. With each on-screen chapter, the poor girl from District 12 continues to fulfill her destiny as an inspiration and a rebel fighter." Ian Nathan of Empire gave the film 4 stars out of 5 and noted that it was even better than the first film. He praised director Lawrence for "taking a more muscular approach" and "sensibly downplaying" the love triangle, noting that "neither [Peeta nor Gale], quite frankly, are fit to lay a pinky on [Katniss'] quiver". One fault he did find was in Philip Seymour Hoffman's "surprisingly ineffective performance". A negative review came from Sophie Monks Kaufman of Little White Lies, who praised Lawrence's performance but criticized the "dilution of the ingredients that made The Hunger Games so gripping." She also found fault with the "lumbering" plot, the "hamminess" of President Snow and Plutarch Heavensbee and the "lackluster and unconvincing script culled from a dramatically difficult book". David Denby of The New Yorker argued that the premise "doesn't make a lot of sense". He praised the "impressive" first act and Jennifer Lawrence, for "project[ing] the kind of strength that Katharine Hepburn had when she was young." Denby found the second act "attenuated and rhythmless" and criticised the "incoherent" finale that "will send the audience scurrying back to the book to find out what’s supposed to be going on". The Hunger Games: Catching Fire earned $424,668,047 in North America and $440,343,699 in other countries for a worldwide total of $865,011,746. Worldwide, it is the 52nd-highest-grossing film, the highest-grossing film of The Hunger Games series, the highest-grossing film distributed by Lionsgate and the fifth-highest-grossing 2013 film. Outside North America, it is the highest-grossing film of The Hunger Games series, the highest-grossing film distributed by Lionsgate and the seventh-highest-grossing 2013 film. On its first weekend, it was only released in Brazil (November 15, 2013), where it grossed $2.4 million on its opening day and $5.26 million for the weekend. On the following Wednesday and Thursday, it opened in 42 more territories, bringing its total to $32 million in a week. The film opened in 63 other territories and earned $138.4 million during the weekend ($146.6 million including its first week in Brazil). Its three largest openings occurred in the UK, Ireland and Malta ($19.8 million), China ($13.0 million) and Germany ($12.9 million). In total earnings, its largest countries are the UK, Ireland and Malta ($55.5 million), Germany ($43.4 million) and Australia ($34.3 million). In North America, Catching Fire is the sixteenth-highest-grossing film, the highest-grossing film of The Hunger Games series, the highest-grossing film distributed by Lionsgate and the highest-grossing 2013 film. Box Office Mojo estimates that the film sold more than 50 million tickets in the US. It became the first 2-D film since 2008's The Dark Knight, as well as the first film with a female lead since 1973's The Exorcist, to top the yearly box office. It is also the top-selling film in Fandango history, surpassing previous record-holder Avatar. The film earned $25.3 million during Thursday late-night showings. It topped the box office on its opening day with $71.0 million (including Thursday late-night showings), which is higher than its predecessor's opening-day gross ($67.3 million) and is also the seventh largest single-day and opening-day gross. During its opening weekend, The Hunger Games: Catching Fire claimed first place with $158.1 million, opening higher than its predecessor ($152.5 million). This was the sixth-highest-grossing opening weekend, the second-highest-grossing opening weekend of 2013 and the highest-grossing opening weekend in November. It was in first place for two consecutive weekends. The film also broke the following records: the biggest Friday for a film in its second weekend, the largest three-day ($74.2 million) and largest five-day ($109.9 million) Thanksgiving gross. It achieved the fifth-highest-grossing opening week (Friday-to-Thursday), the third-highest non-opening Wednesday and the fourth-largest second weekend. In July 2012, Lionsgate announced that two films based on the final book in The Hunger Games trilogy, Mockingjay, were scheduled to be released. The first film, The Hunger Games: Mockingjay – Part 1, was released on November 21, 2014 while the second film, The Hunger Games: Mockingjay – Part 2, was released on November 20, 2015. Principal photography on the two-part film began on September 23, 2013, in Atlanta and concluded on June 20, 2014, in Berlin, Germany. ^ "The Hunger Games: Catching Fire (12A)". Lions Gate UK. British Board of Film Classification. November 5, 2013. Retrieved November 5, 2013. ^ a b c d "The Hunger Games: Catching Fire". Box Office Mojo. Retrieved August 13, 2014. ^ Orzeck, Kurt (January 16, 2012). "Simon Beaufoy Working on Script for 'Hunger Games' Sequel". TheWrap.com. Retrieved January 29, 2013. ^ "'X-Men' Sequel to Shoot in January, Avoiding Conflict for 'Hunger Games' Star Jennifer Lawrence". The Hollywood Reporter. April 5, 2012. Retrieved April 16, 2012. ^ Rome, Emily. "Gary Ross will not direct second 'Hunger Games' installment 'Catching Fire'". Inside Movies (blog). EW.com. Retrieved September 20, 2012. ^ Fleming, Mike. "Lionsgate Getting Close On 'Catching Fire' Director". Deadline.com. Retrieved January 29, 2013. ^ Busis, Hillary (May 24, 2012). "Update your calendars: Lionsgate renames 'Catching Fire'". Entertainment Weekly. Retrieved May 24, 2012. ^ Rome, Emily. "Francis Lawrence offered 'Catching Fire' director gig". Inside Movies (blog). EW.com. Retrieved September 20, 2012. ^ Wigler, Josh (November 9, 2012). "'X-Men: Days Of Future Past′ Shoots In April 2013". MTV Splash Page. Retrieved April 5, 2013. ^ "Jen looks forward to X-Men reunion". Belfast Telegraph. January 10, 2013. Retrieved April 5, 2013. "We're kind of on a little break, we'll go back and finish principal photography in March sometime I think," she said. ^ Sullivan, Kevin P. (June 13, 2012). "'Hunger Games: Catching Fire' To Light Up IMAX Screens". MTV.com. Retrieved June 18, 2012. ^ Kit, Borys. "Jena Malone Chosen as Tribute for 'Catching Fire' (Exclusive)". The Hollywood Reporter. Retrieved July 10, 2012. ^ Cornet, Roth. "Philip Seymour Hoffman Cast As Plutarch Heavensbee in The Hunger Games: Catching Fire". AMC Theatres. Retrieved July 9, 2012. ^ Games, Hunger. "Lynn Cohen Hunger Games". Facebook. Retrieved August 2, 2012. ^ Adly MacKenzie, Carina (August 9, 2012). "'Smallville's' Alan Ritchson joins 'The Hunger Games: Catching Fire' as Gloss". Zap2it. Archived from the original on July 6, 2013. Retrieved August 9, 2012. ^ Wigler, Josh. "'Catching Fire' Casts Sam Claflin As Finnick". Retrieved August 27, 2012. ^ Sperling, Lindsay (September 7, 2012). "Jeffrey Wright Will Play Beetee In The Hunger Games: Catching Fire". WeGotThisCovered.com. Retrieved September 20, 2012. ^ Lawrence, Francis. "How Did Jennifer Lawrence and Sam Claflin Get Ready for The Hunger Games: Catching Fire?". Quora. The Slate Group. Retrieved January 3, 2014. ^ Vary, Adam B. "'The Hunger Games: Catching Fire' begins shooting in Georgia, before moving to Hawaii". Retrieved September 10, 2012. ^ "Video: Jennifer Lawrence Says 'A Little Over a Week Left' on Catching Fire". The Hob. January 11, 2013. Archived from the original on March 11, 2013. Retrieved January 29, 2013. ^ "Jennifer Lawrence looks forward to 'X-Men Days of Future Past' says 'great to see everyone'". The Global Dispatch. Retrieved January 29, 2013. ^ McAllister, Cameron. "'The Hunger Games: Catching Fire' officially begins production in Georgia". Retrieved September 10, 2012. ^ Wilkinson, Amy (November 26, 2012). "'Catching Fire' Arena to be Shot in IMAX". MTV. Retrieved November 27, 2012. ^ Yorio, Kara (January 28, 2013). "CONFIRMED: Sick Jennifer Lawrence was in NJ shooting "The Hunger Games"". North Jersey Media Group. Archived from the original on February 26, 2013. Retrieved May 2, 2013. ^ "Exclusive: Where Did Catching Fire Film in L.A.?". Welcome to District 12. April 1, 2013. Retrieved May 2, 2013. ^ "Weekend Filming Locations including information for Blue Bloods in NYC and Catching Fire in Atlanta". On Location Vacations. April 13, 2013. Retrieved May 2, 2013. ^ "Francis Lawrence Confirms Filming for Catching Fire has Wrapped". Mockingjay.net. April 20, 2013. Retrieved May 2, 2013. ^ "Francis Lawrence Estimates an Hour of Arena in 'Catching Fire'". Mockingjay.net. August 1, 2013. Retrieved August 18, 2013. ^ "'The Hunger Games: Catching Fire' IMAX Featurette Teases Arena Reveal". screenrant.com. October 2, 2013. Retrieved October 2, 2013. ^ "'The Hunger Games: Catching Fire' Features almost 50 Minutes of IMAX Footage". slashfilm.com. November 19, 2013. Retrieved November 22, 2013. ^ "The Hunger Games: Catching Fire Goes Big with IMAX". AVNetwork. November 19, 2013. Retrieved November 30, 2013. ^ Snead, Elizabeth. "'Hunger Games: Catching Fire' Gowns Resemble Alexander McQueen Designs". The Hollywood Reporter. Retrieved October 16, 2013. ^ Vince, Jessica (March 10, 2013). "Meet Tex Saverio - The Designer Behind Katniss's Wedding Dress In The Hunger Games". daily.co.uk. Retrieved January 2, 2014. ^ "Click 98.9 Brad Interviews Ed Sheeran". YouTube. ^ "'Coldplay Confirmed for Catching Fire Soundtrack'". New song, Atlas, for The Hunger Games: Catching Fire soundtrack. August 9, 2013. Retrieved August 14, 2013. ^ "Christina Aguilera Reveals 'Catching Fire' Song". The Hollywood Reporter. ^ "The Hunger Games: Catching Fire' Soundtrack Goes Global, as Lionsgate and Republic Records Add Local All-Star Artists for Albums Sold in Select International Territories". Lionsgate. Retrieved October 16, 2013. ^ "James Newton Howard to Return for 'The Hunger Games: Catching Fire'". Film Music Reporter. October 23, 2012. Retrieved October 23, 2012. ^ "Coldplay written "Atlas" and "We're a Team" for The Hunger Games". ^ "'Catching Fire' Tagline, Logo Reveal in Theaters Now". The Hob. November 16, 2012. Archived from the original on March 14, 2013. Retrieved January 29, 2013. ^ Stransky, Tanner. "'Catching Fire': This week's EW cover | PopWatch | EW.com". Popwatch.ew.com. Retrieved January 29, 2013. ^ McWeeny, Drew (February 22, 2013). "Exclusive: 'Catching Fire' Victory Tour poster immortalizes Jennifer Lawrence and Josh Hutcherson". HitFix. Retrieved May 2, 2013. ^ Gabriel-Pollock, Myriam (March 5, 2013). "MSN Movies exclusive: Katniss Everdeen's Capitol Portrait". MSN. Retrieved May 2, 2013. ^ Hayner, Chris E. (March 6, 2013). "'Hunger Games: Catching Fire' portraits introduce Johanna Mason and Beetee". Zap2it.com. Retrieved May 2, 2013. ^ "'Catching Fire' Johanna Mason Portrait: Jena Malone's Picture From 'Hunger Games' Sequel". Moviefone. March 6, 2013. Retrieved May 2, 2013. ^ "Exclusive! Hunger Games' Josh Hutcherson Is Dapper & Delicious In Peeta's Capitol Portrait!". PerezHilton.com. March 7, 2013. Retrieved May 2, 2013. ^ Goodson, Molly (March 7, 2013). "Exclusive: Liam Hemsworth in Gale's Official Capitol Portrait!". PopSugar.com. Retrieved May 2, 2013. ^ Wilkinson, Amy (March 7, 2013). "'Catching Fire' Capitol Portrait Exclusive: Feast Your Eyes on Finnick!". MTV. Retrieved May 2, 2013. ^ Wilkinson, Amy (April 3, 2013). "'Catching Fire' Trailer To Debut At Movie Awards: Watch Sneak Peek Now!". MTV. Retrieved April 4, 2013. ^ "'Beyond Fire' by T.T.L. – The Score From the Catching Fire Trailer". Mockingjay.net. April 15, 2013. Retrieved May 2, 2013. ^ Bart, Peter. "Comic-Con: 'The Hunger Games: Catching Fire' Heads to San Diego". Variety. Retrieved June 28, 2013. ^ "Walmart - Facebook". facebook.com. ^ Sacks, Ethan (October 28, 2013). "'The Hunger Games: Catching Fire' final trailer is a home run during World Series Game 4". Retrieved October 30, 2013. ^ "Badass Poster Debut: CATCHING FIRE IMAX Poster!". October 30, 2013. Retrieved November 2, 2013. ^ "<헝거게임: 캣칭 파이어> IMAX, 돌비 애트모스 이어 4DX 개봉 확정 (in Korean) WIDECOVERAGE.com". November 15, 2013. Retrieved November 25, 2013. ^ IA Interactive. "Cinépolis". cinepolis.com. Archived from the original on November 25, 2013. ^ "Кто пойдёт на "Голодные игры: И вспыхнет пламя" в 4DX?". Gigamir (in Russian). November 20, 2013. English: Who will go to "The Hunger Games: Catching Fire" in 4DX? ^ "Estreno de Secuela de "Los Juegos Del Hambre" Incluirá Efectos 4DX". La Nación (Chile) (in Spanish). November 20, 2013. Archived from the original on December 27, 2013. Retrieved November 25, 2013. ^ "The Hunger Games: Catching Fire DVD Release Date March 7, 2014". Retrieved February 28, 2014. ^ Schwartz, Art (April 13, 2014). " Heroine addicts Breathless fans meet Hunger Games: Catching Fire stars in Secaucus Read more: Hudson Reporter - Heroine addicts: Breathless fans meet Hunger Games Catching Fire stars in Secaucus". The Hudson Reporter. ^ "The Hunger Games: Catching Fire". the-numbers.com. ^ "The Hunger Games: Catching Fire (2013)". Rotten Tomatoes. Fandango Media. Retrieved November 21, 2015. ^ "The 15th Annual Golden Tomato Awards". Rotten Tomatoes. Fandango Media. Retrieved January 14, 2013. ^ "The Hunger Games: Catching Fire Reviews". Metacritic. CBS Interactive. Retrieved November 21, 2015. ^ Gelt, Jessica (December 1, 2013). "'Frozen,' 'Catching Fire' set Thanksgiving-weekend records". Los Angeles Times. Retrieved December 1, 2013. ^ Jaeger, Kyle (November 21, 2013). "'Hunger Games: Catching Fire': What the Critics Are Saying". The Hollywood Reporter. ^ Staff (November 21, 2013). "'Catching Fire' catches on with critics". CNN. Retrieved November 22, 2013. ^ Labrecque, Jeff (November 21, 2013). "Critical Mass: Is 'Catching Fire' as good as the original 'Hunger Games'?". Entertainment Weekly. Retrieved November 22, 2013. ^ Zacharek, Stephanie (November 15, 2013). "The Hunger Games: Catching Fire Is a Delicious Middle Course". The Village Voice. Retrieved November 15, 2013. ^ Travers, Peter. "The Hunger Games: Catching Fire review". Retrieved November 17, 2013. ^ Susan Wloszczyna (November 22, 2013). "THE HUNGER GAMES: CATCHING". RogerEbert.com. Ebert Digital LLC. Retrieved November 23, 2013. ^ Ian Nathan. "The Hunger Games: Catching Fire". Empire. Retrieved December 3, 2013. ^ Sophie Monks Kaufman. "The Hunger Games: Catching Fire". Little White Lies. Retrieved December 3, 2013. ^ Denby, David (December 2, 2013). "Winners and Losers". The New Yorker. Retrieved December 3, 2013. ^ a b c "The Hunger Games Movies at the Box Office". Box Office Mojo. Retrieved January 17, 2014. ^ "2013 WORLDWIDE GROSSES". Box Office Mojo. Retrieved January 17, 2014. ^ Gille, Zac (November 16, 2013). "Thor 2, Catching Fire, The Best Man Holiday: Weekend Box Office Movies". Alt Film Guide. Retrieved November 16, 2013. ^ "The Hunger Games: Catching Fire (2013)". Box Office Mojo. Retrieved November 22, 2013. ^ Ray Subers (November 17, 2013). "Weekend Report: 'Best Man' Surprises, But 'Thor' Still Repeats". Box Office Mojo. Retrieved November 22, 2013. ^ Jeremy Kay (November 17, 2013). "The Hunger Games: Catching Fire conquers global box office". screendaily.com. Retrieved November 23, 2013. ^ a b Ray Subers (November 24, 2013). "Weekend Report: 'Catching Fire' Burns Bright, Sets November Record". Box Office Mojo. Retrieved December 21, 2013. ^ "The Hunger Games: Catching Fire (2013) - International Box Office Results". Box Office Mojo. Retrieved January 17, 2013. ^ "Lionsgate All Time Box Office Results". Box Office Mojo. Retrieved January 17, 2013. ^ "2013 Domestic Grosses". Box Office Mojo. Retrieved January 17, 2013. ^ "The Hunger Games: Catching Fire (2013)". Box Office Mojo. Retrieved May 31, 2016. ^ Jeff Labrecque (January 10, 2014). "'Catching Fire' tops 'Iron Man 3,' reigns over 2013 box office". Entertainment Weekly. Retrieved January 10, 2014. ^ "'Catching Fire' Is The Box Office Champ For 2013". The Huffington Post. January 11, 2014. Archived from the original on January 11, 2014. Retrieved January 17, 2014. ^ "NORTH AMERICA: 'The Hunger Games: Catching Fire' Posts Staggering Thursday Haul, Easily Tops 'Iron Man 3' (2nd Update)". Boxoffice.com. November 22, 2013. Archived from the original on November 22, 2013. Retrieved November 22, 2013. ^ McClintock, Pamela (November 22, 2013). "Box Office: 'Hunger Games: Catching Fire' Nabs $25 Million Thursday Night". The Hollywood Reporter. Archived from the original on November 22, 2013. Retrieved November 22, 2013. ^ "Box Office: 'Catching Fire' Ablaze Friday With $70.5 Million". The Hollywood Reporter. November 23, 2013. Retrieved November 23, 2013. ^ Ray Subers (November 23, 2013). "Forecast: 'Hunger Games' Sequel to Set Record Books on 'Fire'". Box Office Mojo. Retrieved November 23, 2013. ^ a b c "Weekend Report: 'Catching Fire,' 'Frozen' Set Thanksgiving Records". Box Office Mojo. Retrieved December 2, 2013. ^ "Highest-Grossing Non-Opening Fridays at the Box Office". Box Office Mojo. Retrieved January 17, 2013. ^ "OPENING WEEKS (Friday – Thursday Opening Weeks)". Box Office Mojo. Retrieved January 17, 2013. ^ "Highest-Grossing Non-Opening Wednesdays at the Box Office". Box Office Mojo. Retrieved January 17, 2013. ^ "The 14th Annual Golden Trailer Award Nominees". GoldenTrailer.com. Archived from the original on October 8, 2014. Retrieved May 2, 2013. ^ "Coldplay To Receive The "Hollywood Song Award" At The 17th Annual Hollywood Film Awards For New Hit "Atlas" From The Hunger Games: Catching Fire Soundtrack". PR Newswire. Retrieved October 15, 2013. ^ "19th Annual Critics' Choice Movie Awards Nominations". Retrieved December 16, 2013. ^ "Movies - IGN's Best of 2013". Retrieved January 10, 2014. ^ "People's Choice Awards Nominees/Winners". Retrieved January 3, 2015. ^ "19th Empire Awards Nominations". Retrieved February 24, 2014. ^ "The 15th Annual Golden Trailer Award Nominees". GoldenTrailer.com. Archived from the original on January 5, 2015. Retrieved June 4, 2014. ^ "'Mockingjay' Movie Starts Filming In Atlanta; Jennifer Lawrence, Liam Hemsworth Spotted On 'The Hunger Games' Set". ibtimes.com. September 24, 2013. Retrieved September 25, 2013. ^ "'The Hunger Games' series finishes filming, producer tweets touching photo". hypable.com. June 20, 2014. Retrieved June 23, 2014.